You are relaxing on your sofa, it is late night and you are watching Star Trek: The Next Generation on KOFY-TV. It seems you have seen this episode a zillion times before, you know it by heart. That does not matter, you have seen all five Star Trek television series and eleven Star Trek feature films. If only you could sit in the Captain’s chair on the Starship Enterprise. Guess what kids! Not only can you sit in the Captain’s chair on an authentic replica of the Enterprise bridge, you will see original costumes, genuine props and authentic recreations of sets from the television series and feature films at Star Trek: The Exhibition coming to the Tech Museum. You will also be able to ride through a Star Trek adventure in your choice of two full-motion flight simulators (extra fee). Photography of any kind is not allowed inside Star Trek: The Exhibition; however, photos on the Bridge will be taken by a professional vendor. Star Trek: The Exhibition begins October 23 and will run at least through the Christmas holidays. Tickets (includes admission to the museum): $25.00, adults; $19.00, ages 3-17; $22.00, seniors and college students. Other pricing options are available. Tech members get up to 40 percent off. Fees for the simulator rides: $5.00 for the two-seat ride (the more aggressive of the two); $6.00 for the eight-seat ride; $8.00 to ride them both. 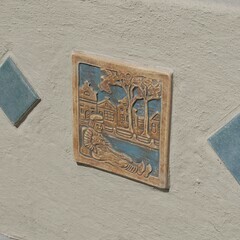 Bachelder 'Dutch Boy' tiles were reproduced as part of the restoration of the Rotary Ryland Pool. Near-downtown residents got together today to celebrate the completion of historical restoration work on the Rotary Ryland Pool at Ryland Park in the Vendome neighborhood. Vendome Neighborhood Association president Tina Morrill presented restored tilework on the pool, as well as educational signage, a commemorative plaque, and a new sign for the entry to the pool. The pool was originally built in the 1920’s, featuring the Batchelder “Dutch Boy” tiles around its perimeter wall. These tiles were later painted over, probably in the 1970’s. What’s worse, to make the paint adhere better, the tiles were sandblasted, eliminating their original glaze and much of their relief pattern. In 2006, when the city of San Jose wanted to close the pool, the public outcry, massive efforts by a small group of volunteers, and $1.4 million in funding came together to save it. The pool reopened last summer, but the historical restoration work continued over the past year. Reproduction Dutch Boy tiles were produced from a mold taken from a 1920’s era Batchelder tile found at an out-of-state antique tile dealer. A commemorative plaque was installed, recognizing the contribution of the Rotary Club in donating the original pool and funding the recent restoration work. An education placard was also posted, explaining the restoration proces, and also hopefully making the point that historic resources should not be treated as cavalierly as the pool and its tiles once were. Finally, a new sign was added at the entry to the pool, designed by Northsider Sonya Lu and fabricated by Brian’s Welding, just down the street from the park. The new entryway sign at Ryland Pool. It looks like the days of disposable plastic shopping bags are numbered, at least in San Jose. We pay for those “free” bags in numerous subtle—but substantial—ways. Since grocery stores spend billions of dollars for single-use bags in the U.S., a share of those costs undoubtedly find their way to consumers in the form of higher food prices. Waste haulers and recyclers in San José suffer repeated breakdowns when the plastic bags become lodged in their digesters, requiring manual removal that forces them to shut down machinery several times a day. As rate payers, we pay for those additional labor costs on the order of hundreds of thousands of dollars each year. In a myriad of ways, we also pay for the litter resulting from the thoughtless disposal of these bags, the most obviously through the cost to taxpayers to dislodge and clean the bags from clogged outfalls, sewers, and streams. In addition to these costs, we face the challenge of reducing the bags that are filling our landfills as we try to move toward “zero waste” strategies to address our lack of landfill space. Plastic bag recycling has several limitations. It’s not easy for consumers to know which kinds of plastic can be recycled, and any food debris or other contaminants will make the plastic undesirable for recyclers. Market realities also make it challenging; as reported in the Christian Science Monitor (March 29, 2007, “Seldom Recycled”), it costs $4,000 to process and recycle one ton of plastic bags, which can then be sold on the commodities market for $32. Where recycling often requires heavy taxpayer subsidies, it’s better to keep the product out of the waste stream rather than spinning our wheels in quixotic recycling efforts. And not only are the costs of keeping the disposable bags high, the inconvenience of doing away with them is really minimal. Travelling in Europe last year, I got to see how a bag ban could work in practice. In Hungary, Austria, and the Czech Republic I never saw a grocery store give away a bag, but it was no problem. The key is one thing that doesn’t seem to have caught on here yet: re-usable plastic bags. Much heavier-duty than the current disposable bags, they could still be folded up and kept in your pocket. They cost only about 25 cents each, and lasted through dozens of grocery trips. There’s still a few hurdles before San Jose truly goes disposable-bag-free, but the city council deserves kudos for setting this in motion. October 4th is just a couple of weeks away, so it is time for San Jose runners to get ready for the Rock ‘n’ Roll 1/2 Marathon. Though this news is exciting for the runners, and good for the city, for me it is just ho-hum. That was until I heard about the post race concert. * Finish Line Festival Stage – Plaza de Caesar Chavez. # 1 Jonny Lang – (Grammy winner) is the concert headliner. # 3 Lang is scheduled to take the stage around 12 PM. Are you tired of driving by the creeks around San Jose only to see them clogged with debris of all sorts? Here’s your chance to do something about it! This year is the 25th Anniversary of California Coastal Cleanup Day, one of the largest events of it’s kind of the year. Just because we aren’t actually on the coast doesn’t mean we can’t chip in and clean up our waterways (which eventually lead to the ocean) now does it? Last year, just in Santa Clara County alone, 1,331 volunteers removed 95,656 pounds (47.8 tons) of debris and 16,327 pounds (8.2 tons) of recyclables from 26 locations throughout the county. So get on over to CleanaCreek.org and find out the details on one of the 35 locations targeted for clean-up. Bring your own gloves, sturdy shoes, sunscreen, a hat and some water (in a recycled bottle please!) and pitch in. You’ll also need to download and sign a waiver to participate, and it’s a good idea to visit the volunteer page for instructions. Bark in the Park is a fundraising event with big dogs, little dogs, skilled dogs, not so skilled dogs; well, you get the idea. 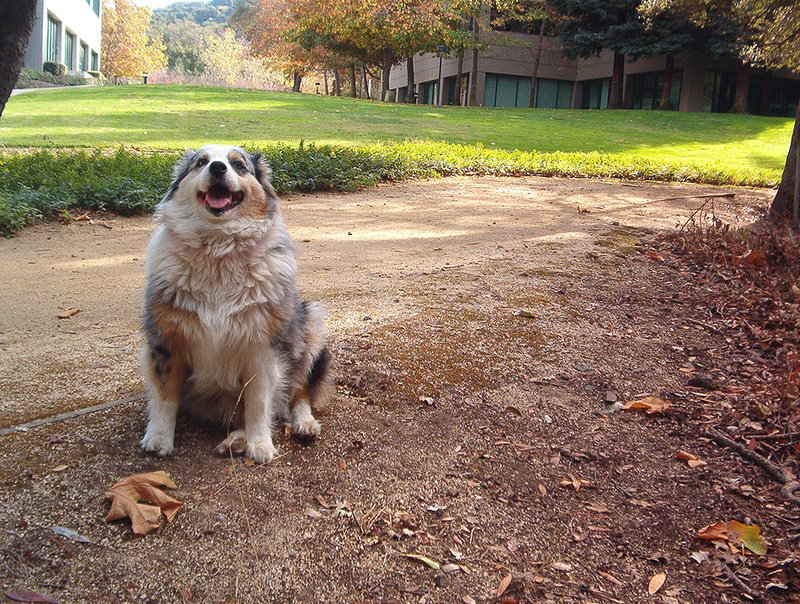 A portion of the proceeds benefits the Humane Society Silicon Valley and San Jose Animal Care Center. Throughout the day at various times: dancing dogs, dog water park, free dog agility course, flyball canine relay, performing dogs, grooming, training tips and herding demonstrations. In addition, 99 cents rabies vaccinations, low cost microchipping, dog-related vendors and what would an event be without kid’s activities? White on Rice will appear at Camera 3 starting Friday, September 18. A few months ago, I mentioned the film White on Rice, which headlined the San Francisco Asian-American Film Festival’s San Jose presentations. Now the film is back, booked for a one week run at the Camera 3 in downtown San Jose. The film is about a 40-year-old guy who’s recently gotten divorced and moved in with his sister, where he’s sharing a bunk bed with his 10-year-old nephew. He refuses to grow up, but still hopes to find the perfect replacement for his departed wife. All the reviews I’ve seen say it’s really funny. Even better, with a special coupon you can download from the San Jose chapter of the Japanese-American Citizens League, proceeds from your attendance on the opening weekend will benefit JACL. The coupon is only good Friday through Sunday, and it doesn’t change the price of your ticket, but it does redirect part(?) of your ticket payment to JACL, to support their educational, civil rights, and cultural programs. Where: Camera 3 Cinema, 288 S. Second St., San Jose. Technology Benefiting Humanity is The Tech’s new permanent exhibition linking social responsibility with technology, intended to encourage a deeper understanding of the technologies that are improving the human condition. 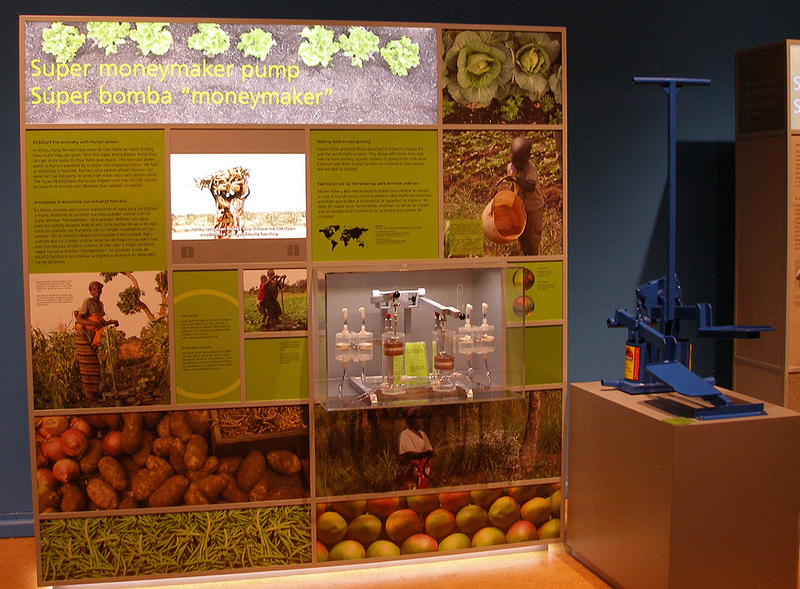 The new gallery showcases inventions from past Tech Awards Laureates, which will be routinely updated. The Tech Awards is one of the premier annual humanitarian awards programs in the world, recognizing technical solutions that address the most critical issues facing our planet and its people. The program honors 15 global innovators (Laureates) who are applying technology to benefit humanity in five universal categories: environment, economic development, education, equality and health. The Laureates include individuals, non-profit organizations, and for-profit organizations/companies. The five categories are represented in the new gallery. The exhibits are basically lit up multi-purpose display modules that you stand there and read. Some have sound and video along with a few simplistic hands-on activities. Actually, you can find this information and a great deal more on The Tech Awards website.